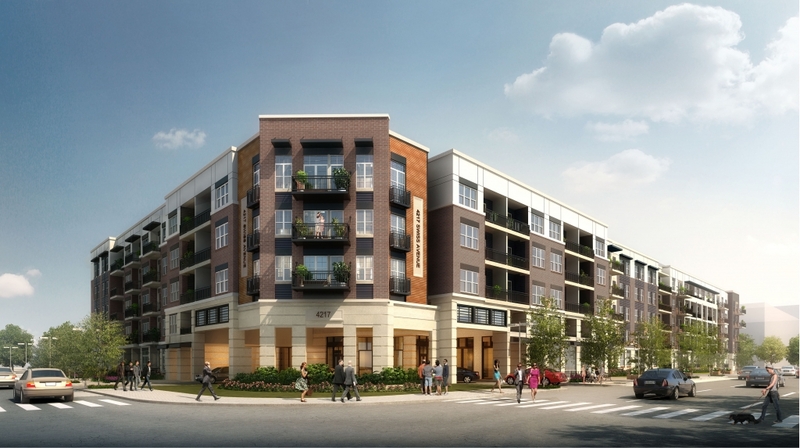 Encore Swiss Ave. will be a thoughtfully designed luxury apartment community in Dallas’s near east side close to the Baylor University Medical Center at Dallas. (Dallas, Texas) January 19, 2017 – Encore Multi-Family, LLC, a subsidiary of the Dallas-based Encore Enterprises, Inc., has officially broken ground on Encore Swiss Avenue on the corner of Swiss Avenue and North Peak Street near East Dallas. The thoughtfully designed 253-unit and 204,752 square-foot multi-family community will feature a contemporary design with a nod to the historical nature of the neighborhood. The leasing office and front door will front Swiss Avenue providing a pedestrian connection to the enhanced streetscape and landscape parkway. The Residents will enjoy a luxurious clubroom for entertaining and business center both directly linked to a formally landscaped pool courtyard with fountains, raised spa, casual seating and grill stations. Other amenities include a state-of-the-art fitness facility and 24-hour package concierge. Encore Swiss Avenue will offer a variety of one and two-bedroom units designed to provide variability in pricing to the market. All units are professionally designed and will have the latest finishes including stainless steel appliances, energy efficient LED lighting fixtures, and individual full size washer/dryers. Construction for Encore Swiss Avenue is currently under way first units available for occupancy the First Quarter 2018. Encore Multi-Family, LLC is a subsidiary of Encore Enterprises, Inc. and was founded in 2008 as a fully integrated multi-family developer, owner and operator. The company is involved in all aspects of multifamily development projects and acquisitions including ground-up developments, joint ventures and mixed-use turnkey developments. For more information about Encore Multi-Family, LLC, visit encore.bz or call (214) 259-7000.